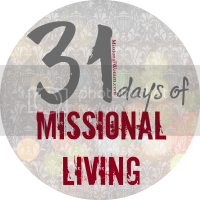 Starting October 1st we are starting 31 days of Missional Living. If you want to follow along grab the code from the box to the right and paste in your sidebar on your blog as a reminder. So go ahead and link up below by clicking the link below and following the prompts. Please just let your readers know by including a link at the bottom of your post (or somewhere on your side bar) or put my button code (found on the side bar) so they can find these other great people glorifying God and we can continue to grow as a community.Thanks! Thanks for hosting. I hope you have a wonderful weekend! Thank you Laura for hosting such an encouraging link up every week. I'm so glad to have found you and your inspiring blog! Glad to have you Debbie. :) Love what you're doing!! I'm excited about the series coming up in October. The Nester also does a 31 day series in October so I'm thinking of what topic I want to stick with for 31 days. I love that you have this already figured out. I assume you will be linking up with the Nester? I did that last year but don't know if I'll do it this year. Just been too busy with my son's wedding and my mom's health. Don't know if I'm up to doing 31 days, lol! Thanks for hosting today. Yeah, we had to think way ahead since all the posts for the month have to be in by the 15th of the previous month. What great contributors huh!! But yes, will link up at the nester. And I totally get it about being too busy.... 31 days is a lot. Thank you for the opportunity to share my post with your readers and to check out all the other great posts! I love your idea of a Faith Filled Friday Link-up! Great to have you Missy! !